The Student Union P3 Experience at the University of Kansas – Information and thought leadership on this dynamic market! By David Mucci, Director of the KU Memorial Union. Bio below. In the spring of 2015, the KU Memorial Union was invited to join a $350 million public/private partnership (3P) development that was transforming the University of Kansas (KU) landscape. The Union at KU operates as an auxiliary responsible for dining, retail and student union functions and undertook an evaluation of its abilities to participate. With an enrollment of 24,000 at its main campus, KU is a public institution located in Lawrence, Kansas. It is an R1 research institution and a member of the Association of American Universities, a factor that drove the project to create state-of-the-art science classrooms and labs. In early fall 2014 the project launched, and it seemed a student union presence should be an integral part of the development. The project, once launched, entered an accelerated planning stage. Intense multi-day sessions were undertaken between the developer, contractors, consultants and architects and the various facility users. Sessions moved rapidly and entailed continuous project refinement and advancement outside and between campus visits by developer and project partners. Site preparation also accelerated beginning with the demolition of the dated satellite student union. The ability to move so quickly by the various departments was facilitated by the recent KU master plan that included various financial and customer surveys and studies (the Union concurrently completed a related planning exercise). These studies, combined with consultant expertise, expedited work through advance resolution of issues. The plan deviated from the standard practice of starting from a program description. In this instance, the financial elements dictated the initial project outline. The Union, with the approval of the student senate, was able to redirect an existing renovation fee to build the new Union. From construction cost estimates, facility square footage and appointment levels were then determined. On that basis, the Union entered into the initial negotiation and planning for the project. Perkins+Will was the architectural firm connected with the selected developer. Edgemoor engaged the architects as part of their package due to their expertise in both union and science facility design, thus making their proposal uniquely competitive in satisfying both project needs. Developer selection was undertaken through a Request for Proposals as the project operated outside of normal state processes due to its financing arrangements. The project also incorporated a third-party manager for general maintenance and for systems operation. The Union, due to its special audiences, was able to carve out responsibility for custodial and event set-up for its own crews. Johnson Controls ultimately was awarded a fifteen-year contract for district maintenance, with facility lifestyle restoration set at a .70 FVC level at the end of the contract period. The University retained responsibility for life safety and grounds maintenance and for providing utilities (with the Union billed for metered use). General student fees (retained from the previous satellite union) and generated revenues covered operational costs beyond the re-designated student fee. The Union construction lease-to-own term was twenty-five years versus thirty for the entire project; advantageous project financing and a calibrated increase to the annual payment rate made this adjustment possible. The project continued to be a series of negotiations and adjustments between the union and the university-controlled development corporation. The understandings of the proposal had to be fully divined and established once the project was in play in typical design/build fashion. For the Union, issues arose related to room dividers (the developer specified conventional; the Union expected Skyfold), AV/Tech (originally to be provided but ultimately assumed by the Union due to overall project limits), and the kitchen (developer expectations were a “serving kitchen” despite Union indications of “production” requirements). Ultimately, these issues were resolved within the context of the full project priorities and horse-trading (the Union gained unassigned space in a lower level in return for assuming costs outside the project). The replacement union (Burge Union) ultimately consists of a 32,000-square-foot facility (the original was approximately 55,000 square feet). Burge now meets a critical campus need for a flat, open, flexible space to accommodate major events. It rests across from a major science complex, adjacent to a parking garage and amidst a new apartment group. The project rapidly advanced when freed of university and state process limitations. The project benefitted from advantageous financial arrangements outside conventional institutional means. The combination of speed, financial advantage and economies of scale saved KU and the Union thirty percent compared to conventional projects. 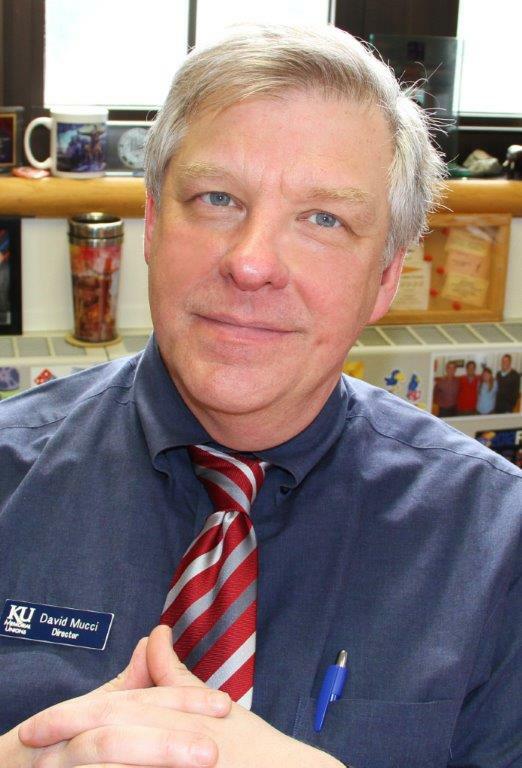 DAVID MUCCI is Director of the KU Memorial Union at the University of Kansas. The Union is a 501(c)3 affiliated corporation responsible for dining services, bookstore retail and event services on campus. The program includes operation of the Kansas Union, the DeBruce Center (home of the original rules of basketball) and the soon to open Burge Union.